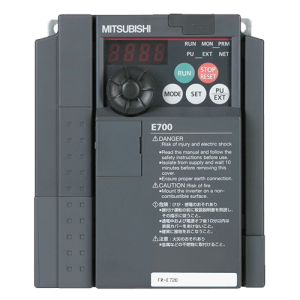 With 17 million frequency inverter drives already sold, Mitsubishi Electric introduces the compact inverters of the FR-E700 SC series. In addition to better features and performance than their predecessors, the models in the FR-E700 SC series are also more compact and even easier to install. Some of the outstanding featues are the integrated USB port, an integrated onetouch Digital Dial control with a display, optimum power usage at low speeds and an expansion slot compatible with the many option cards from the 700 series. All this makes the FR-E700 SC an economical and highly-versatile solution for a wide range of applications from textiles machines to door and gate drive systems to material handling systems. To protect both staff and valuable machinery the FR-E700 SC series is packed with innovative functions that enable the inverters to respond with great sensitivity to a variety of external events. Integrated emergency stop function: The FR-E700 SC series has a two channel emergency stop for safe shutdown. This ensures safe operation in compliance with the European Machinery Directive without installation of another contractor. The FR-E700 SC thus conforms to the ISO 13849-1, PLd and IEC60204-1 cat. O standards. Sensorless Vector Control: The outstanding speed and torque performance and the fast response of the FR-E700 SC are due to a large extent to the Sensorless Vector Control system. This technology makes it possible to achieve exceptional speed and torque performance, even with motors that do not have encoder feedback loops, thus saving additional hardware costs. Advanced Autotuning: Good motor control is only possible with accurate motor data. This current generation of inverter drives has an Auto-tuning function that can read out all the necessary parameters directly from the motor in less than a minute, even when it is not running. Overload capacity increased to 200%: The maximum short-term overload capacity is 200% for a full 3 seconds. This makes it much easier to select the right frequency inverter drive for our application and also reduces wasteful downtime caused by overload alarms. Torque limiting: Improved torque/current limiting during startup and deceleration ensures better protection for your machines, reliably preventing machine damage.